Are your cabinets in need of new life? Do they look tired and dingy, or dated and old? If so, you might be considering ripping them out and replacing them. The cost of cabinet replacement will certainly give most people pause. There's good news, though: That's not your only option. In fact, there's a much more cost-effective way: Simply call Palmer Pro to paint or refinish them. We at Palmer Pro, we specialize in staining cabinets or painting them to your liking. It's a fantastic way to get a beautiful set of cabinets for a fraction of the cost of replacing them. Call (832) 410-1868 for a quote today. 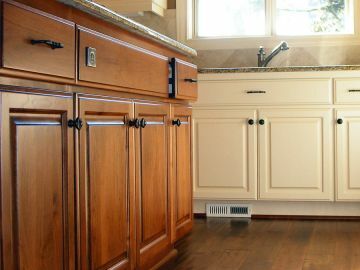 Why Opt for Cabinet Refinishing? Why paint your cabinets when you could just invest in brand-new ones? Why not take an "out with the old" approach? The answer is simple: economics. While you could replace your entire kitchen cabinet setup, that will be an expensive approach and one that may not be necessary. If your frame and doors are in good condition, Palmer Pro can offer an affordable solution, and update your kitchen to suit your whim. In business since 2015, Palmer Pro can deliver outstanding results. If you're looking for a beautiful, streamlined way to update your kitchen, this is it. Simply add some new hardware and you've got an entirely new look! Here at Palmer Pro, we specialize in sanding, staining, matching colors, using long-lasting paint and coming up with cost-effective means to transform your kitchen or bathroom cabinets. Our professionals are reliable and fully trained, and we always go the extra mile to ensure you get what you need from our team. Dedicated to quality and beautiful results, we pride ourselves on solid work and fast turnaround times. When you partner with us, you won't have to worry about sloppy preparation, inexperienced techs or a project that takes forever. Instead, you'll get beautiful, new looking cabinets the blink of an eye. What's more, Palmer Pro's services are professional and affordable. We're happy to provide accurate quotes to help you plan your budget, and we'll stick to it. To learn more, contact Palmer Pro today at (832) 410-1868. We'll answer any questions you may have and take the steps to start planning your paint job now!